In the 1970’s Wegner designed a range of elegant modernist furniture using supporting frames of flat steel for Johannes Hansen which are now produced by Carl Hansen and Søn. 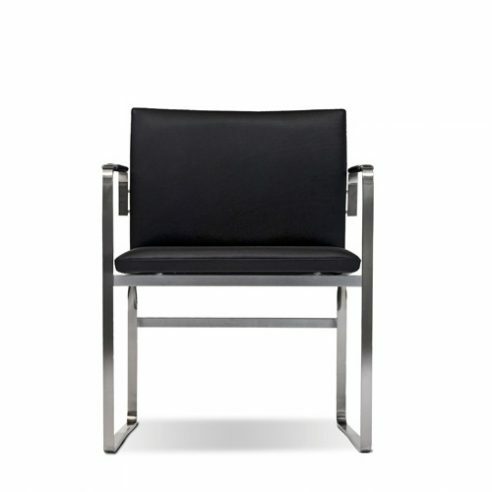 The CH111 desk or meeting chair features stretched leather on a flat steel frame the rear legs of which Wegner turned through 180 degrees to provide support for the upholstery on the chair’s back. The chair belongs to a family of chairs designed by Wegner reminiscent 18 th century Spanish chairs. Wegner like his great friend Børge Mogensen was fascinated by the use of stretched leather upholstery of Spanish chairs of this period.